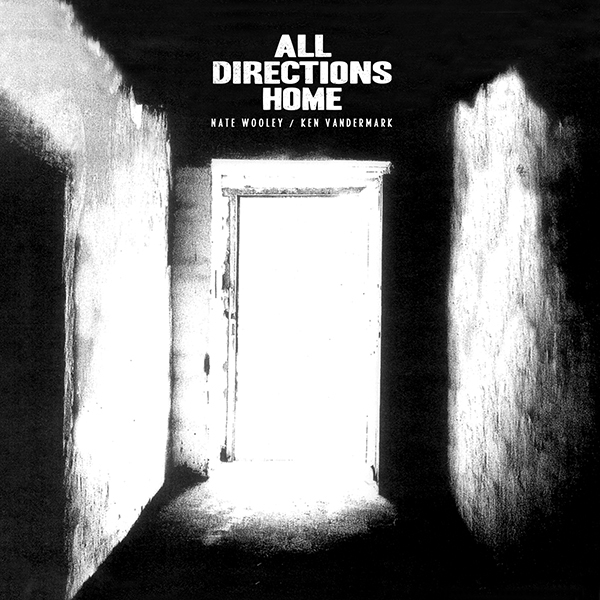 Recorded last summer at The Sugar Maple, in Milwaukee, the latest release from Ken Vandermark and Nate Wooley, All Directions Home, wastes exactly no time getting going. The opener, Vandermark’s “Another Lecture (For Walter Benjamin),” is a hearty, up-tempo blues that absolutely swings. Vandermark and Wooley trade solos woven between unison lines. They rapidly bound ideas back and forth, with Vandermark on baritone sax and Wooley playing to the middle. About a minute in, they lock into a fantastic melody, with Vandermark bounding through a deep bass-like riff, followed by a return to the playful start-stop of the opening. Later, Vandermark forcefully propels Wooley’s “Lutoslawski,” filling in for an absent rhythm section. He fully owns the lower register, scattering notes across the spectrum during his solos. His second, about two-and-a-half minutes in, takes on the entire breadth of the instrument, and is one my favorite solos on the album. “Battle Piece C,” presents a very different view of Wooley’s Battle Pieces project, which was documented last year in a quartet setting (and was one of my personal favorites of 2015). Here, Vandemark lays out a series of pops and squeaks, while Wooley slowly fades in with breathy solo. There’s no tape deconstruction, and the whole track ends after only a couple of minutes. It prompted me to wonder about a future duos-trios-quartets Battle Pieces set, really pushing the limits of that compositional framework. “Calling (For Elfriede Jelinek)” is the intensely meditative centerpiece; a showcase for extended techniques from both Vandermark and Wooley, it’s also the most emotionally demanding piece on the album. Knowledge of Jelinek or her work as a novelist and playwright certainly isn’t required, but Vandermark has composed a piece that nicely echoes themes found in her writing. His yearning extended solo towards the end is buoyed by Wooley’s near-silent flutter. Patiently, the two fade to silence, before jumping right into Vandermark’s fantastic “Such Science (For Duke Ellington and Muhammad Ali).” I don’t know if it’ll happen, but I would love to hear an Audio One or Resonance Ensemble take on this. Towards the end, Vandermark and Wooley layer contrasting solos, then abruptly restate the theme in the final 10 seconds. It’s a thrill ride, start to finish. There are two covers, Ornette Coleman’s “I Heard It Over the Radio” (also covered by Aki Takase and Silke Eberhard on their duo outing) and ‘Mississippi’ Fred McDowell’s “Done Left Here.” On “I Heard It Over the Radio,” Vandermark and Wooley’s approach draws out the blues that’s always at the heart of Coleman’s music, slows the tempo slightly, and packs a lot of space around the melody, which doesn’t appear until about a minute in. Wooley plays a sprightly, singing solo at the midpoint, before the two return to the melody. There’s an apt playfulness to the arrangement, and a really heartfelt, brief solo from Vandermark caps a year of tributes to the great Coleman. Closing the album, “Done Left Here” is presented as a fairly straightforward cover, the duo laying its contemporary sound atop a foundation of McDowell’s hill country blues. Wooley screams a high register solo, while Vandermark plays a churning take on McDowell’s slide-guitar run. Then comes a lengthy fade, during which the two quietly trade off the melody, before ending on a unison line, echoing the very first notes of the album. Unfortunately, All Directions Home” is yet another release that dropped late in the year and was mostly passed over, save perhaps those following Vandermark and Wooley’s career very closely. The pairing is a fruitful one, with two bridging their deep interests in jazz history and tradition with their equally unique talents using extended techniques and crafting avant-garde compositions. In just a few years, we’ve already had two albums, and I really hope this pace continues. Highly recommended.